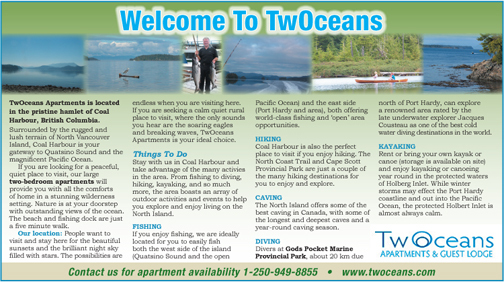 TwOceans Apartments is located in the pristine hamlet of Coal Harbour, British Columbia. Surrounded by the rugged and lush terrain of North Vancouver Island, Coal Harbour is your gateway to Quatsino Sound and the magnificent Pacific Ocean. If you are looking for a peaceful, quiet place to visit, our large two-bedroom apartments will provide you with all the comforts of home in a stunning wilderness setting. Nature is at your doorstep with outstanding views of the ocean. The beach and fishing dock are just a five minute walk. Our location: People want to visit and stay here for the beautiful sunsets and the brilliant night sky filled with stars. The possibilities are endless when you are visiting here. If you are seeking a calm quiet rural place to visit, where the only sounds you hear are the soaring eagles and breaking waves, TwOceans Apartments is your ideal choice. Stay with us in Coal Harbour and take advantage of the many activies in the area. From fishing to diving, hiking, kayaking, and so much more, the area boasts an array of outdoor activities and events to help you explore and enjoy living on the North Island. If you enjoy fishing, we are ideally located for you to easily fish both the west side of the island (Quatsino Sound and the open Pacific Ocean) and the east side (Port Hardy and area), both offering world-class fishing and ‘open’ area opportunities. Coal Harbour is also the perfect place to visit if you enjoy hiking. The North Coast Trail and Cape Scott Provincial Park are just a couple of the many hiking destinations for you to enjoy and explore. The North Island offers some of the best caving in Canada, with some of the longest and deepest caves and a year-round caving season. Divers at Gods Pocket Marine Provincial Park, about 20 km due north of Port Hardy, can explore a renowned area rated by the late underwater explorer Jacques Cousteau as one of the best cold water diving destinations in the world. Rent or bring your own kayak or canoe (storage is available on site) and enjoy kayaking or canoeing year round in the protected waters of Holberg Inlet. While winter storms may effect the Port Hardy coastline and out into the Pacific Ocean, the protected Holbert Inlet is almost always calm. ← Previous Story What Does “All Inclusive” Mean To You? Next Story → How Often Do You Have “AH HA” moments?